Today, I was able to experience something that not many university students get the chance to experience: an opportunity to implement change within the community. Several months ago, I decided to join a club on campus called ” Enactus ” which revolves around the idea of implementing a positive change within the community through various projects. After being involved in several activities and clubs throughout high school and university, I figured it was time to use my skills to give back, however big or small that could be. I joined a project called “Teengage”, where our main task is to educate the youth in our community about entrepreneurship, business as a whole, and inspire them to give back as well. In fact, we give them an opportunity to pitch a business idea at a competition we host at the university to a professional panel of judges to obtain funding. Today, I stepped into a grade 10 classroom with my teammate not knowing what to expect. The last thing I wanted to do was to talk at the class, but rather talk with the class. We had practiced the presentation and planned it out carefully to make sure that it was fun, engaging, and well let’s be honest… not boring. As we presented, I realized that rather than them being bored and pulling out their phones, the students were engaging, asking questions, and were interested in the information we were providing them. Showing success stories such as Shopify, to explaining how important it is to stay environmentally friendly, we touched on many relevant and inspiring topics that sparked their attention. To conclude our presentation, we introduced an activity where each group received 2 paper cups, 2 paper plates, popsicle sticks, and tape. They were to use these objects, and objects around them, to create a new product before pitching it to the class. The results were significantly better and more creative than we had anticipated! iPhone speakers that enhanced the volume of the music, hands-free binoculars, helicopter with webcam, and more. Not only that, but their pitches contained information that we had just presented them, including ways of improvement, future forecast plans, and their target audiences. To say the least, we were blown away by their quick thinking, and application of what we had just presented to them. In fact, after we finished our presentation and exercise, many of the students’ interest had sparked in regards to the “Perfect Pitch” competition (presented by Enactus and Alterna Savings) that we are to host in the following month. This, was an incredible opportunity to spark some light bulbs in the room and show that many opportunities are within reach as long as passion and motivation are present. I also learnt to never underestimate grade 10s. 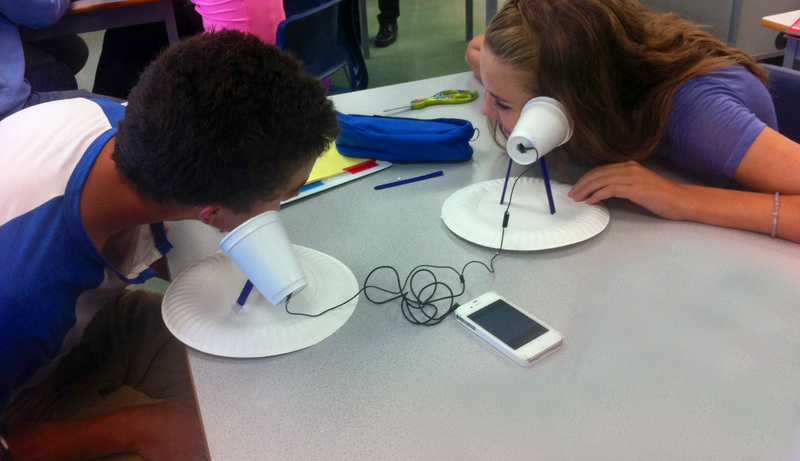 Students use household materials to create innovative products.